Mereology is a metaphysical theory of how parts relate to wholes for composite objects, which would be all objects in our experience. Only fundamental physical objects can be said to be simples without parts, as far as we can tell. One problem that arises for mereology is the possibility that any conceivable arrangement of parts could make a whole. So the head of a trout and the body of a turkey would form a trout-turkey. Why would such a strange concern arise? Consider that living things are made up of cells, and those cells are separated by a small distance (1 nanometer or what have you). If parts can be spatially separated but remain part of the whole, then where do we draw the line ontologically? It's true that a trout-turkey is a ridiculous whole to us humans, but if we're concerned with what really exists (ontology), then we can't just dismiss trout-turkeys on the grounds that they're strange and play no role in our everyday conception of the world. A trout-turkey (or any other counter-intuitive arrangement of parts) brings into question the notion of whether composite objects are really wholes. Does a trout or turkey actually exist, or only the parts making it up? Perhaps our experience of trouts and turkeys is a false one, even though it's useful. Trouts, turkey, tables, stars, human beings, etc are not really wholes. Only subatomic particles are. My first thought is that a (living) trout-turkey wouldn’t make a functional, i.e. purposeful, whole and, thus, could not exist. The head would be equipped for swimming and the body for walking, etc. Everything that we take to be a whole, however, holds a unitary functionality. From rocks, to tables, to living beings. So two items placed together would not constitute an new whole unless the composite now held a unitary set of behaviors—be these entropic or negentropic. Molecules, like individual proteins, are thereby wholes constituted of lesser wholes (atoms). That's a good answer, and some philosophers are committed to living things being an exception. Living things can have parts. Seems to me the same argument can be made for machines. The problem with things like rocks is we can easily get into sorites issues. How many mineral parts are needed to make a rock? Is it the same rock after it's been weathered? If you have a bunch of rocks piled together, do they form a rock heap? What's the fundamental difference between a heap of rocks, and the rock minerals inside a rock? whatever it is, sounds good to eat. It does. Certainly better than the tofu-turkey I had recently. Also, someone made a shrimp-eating addendum to Stove's worst argument. So if anyone manages to eat a trout-turkey, then we can be sure it exists. I rather like the idea of doing philosophy through eating. Vision has been abused for centuries. Time to take a culinary turn. Actually sorry to digress but just made a Thai beef salad with faux beef. Trying to scale back on meat for environmental and ethical reasons. Jolly nice too. On the theme of your OP, somewhere in Aristotle, I seem to recall, there’s a passage about how at some point, all the body parts of animals were mixed up, and there were absurd looking creatures like the type you describe. Then something happened to shake them all out into the animals we see today. I seem to remember that this was given as one of the precursors of evolution. Perhaps our experience of trouts and turkeys is a false one, even though it's useful. Trouts, turkey, tables, stars, human beings, etc are not really wholes. Only subatomic particles are. But what does this really show? I think it shows that man's conception of reality is not reality as such. There are no perfect triangles, circles, or wholes in the great outdoors. While the part/whole conception may be necessary if knowledge is to progress, its perfect realization in reality is simply "good enough for government work"
If living beings are a mishmash of particles structurally and functionally determined by genetic precursors, and different genes results in different species, then what we consider to be a trout or a turkey becomes only relative to the context in which it is coded, or genetically coded. In reality, we don't see trout-turkeys, we discern one from the other based on their individual properties. I.e. a trout is a fish, a turkey is a bird; they have different genetics. But in a hypothetical sense, we can postulate such a variation in genetics. Genes are composed of subatomic particles which contribute in different proportions to a greater whole. It's not a stretch to assume that such a difference in conventionally observed proportion may result in an 'abnormal' or unobserved species being formed, such as with genetic mutation and so forth. This is, after all, the principle of evolution. However, we can also say that the ability to discern trout from turkey stems from our minds capacity to reason with our perceived observations. Our perception doesn't quite cross the bridge between macro and micro, although it does a good job of providing us with what we need for survival. I mean that we do not directly observe subatomic particles as wholes in and of themselves, but rather as components of the directly observed perceivable reality (objects etc). So when we describe one thing as that thing based on it's individual properties compared to another thing with different individual properties, the properties we are describing are perceptual by-products of different proportions of quantum stuff - particle physics does a good job of grouping these singularities into a coherent system. The point is, it just so happens that when different proportions of particles interact in a certain way with other proportions of particles of favourable characteristic, that the two coalesce and work as a single system. Anything we consider separate from something else is only separate within the scope of human perception. Imagine we were deprived of our sensory perception. We couldn't see, touch, taste, hear or smell. Without us to perceive separate bundles of quantum stuff interacting and essentially composing matter - atoms, ions and molecules, and therefore having different characteristic properties and interacting in different ways as perceptible to our senses, what would we be left with? It's almost impossible to say, without perception to give us some grasp on what it would be. The fact animals evolved and life exists by facilitating sensory perception and stimulus-response relationships demonstrates how a smaller fundamental building block can be replicated in an almost boundless combination of possibilities to go from what is basically simple to the infinite complexity we observe in nature and in our own thought processes. The fact we can even conceptualise such things as a trout-turkey in a human context is itself contingent upon the relative proportions of different atoms and therefore quantum stuff that our brains and bodies are composed of. If I could exist then a trout-turkey could too. As in, if the situational variables which contributed to the formation of the cause meant that it went on to produce the effect, then the outcome would be produced. If the genes were combined in a different way, perhaps a different outcome may result in the entertained phenomena, but this is only a possibility. The distinction is that this is potential rather than something actually observed in reality. If and only if the causal variables came into play that resulted in a trout-turkey actually being produced would the outcome actually happen. Although we have not perceived trout-turkeys directly using our senses, we can entertain them as possibilities within our minds on the basis that their realism would be determined by other realised causal factors that haven't yet manifested. As with perception, you could argue the world we perceive is limited by the sensory organs through which we perceive it, hence we as humans have access to only a small chunk of the electromagnetic spectrum or hearing a range of frequencies. It is safe to say, however, that our empirical understanding is an accurate account for the way the world is, at least through our senses. But hypothetically, as we are a bundle of different proportions of the same fundamental matter, is perception really an accurate account for the way the world really is? The micro seems very different to the macro the more we examine it, and yet it is the same thing. Is objective empirical understanding really getting anywhere if perception is limited by the subjective parameters of the sensory organs? If it's not getting us anywhere, are we doing something wrong? If it is getting us somewhere, where is it getting us? Toward a subjectively sensory conception of Truth? Or to an objective Truth that is revealed through perception? I guess it's all mere speculation. That there is no mathematically precise denotation of when particles of sand become heaps of sand is, by all evident accounts, a solid given. So it can’t then be intrinsic to that observed. When do accumulating particles of sand take on the cognitively perceived/understood unitary functionality of a heap? There is an in-between fuzzy zone where individual humans (to whom the concept of heap applies) will strongly disagree. Yet, most all humans will agree on extremities: that one particle of sand is not a heap and that a hundred thousand particles of sand structured in a certain way does constitute a heap of sand. But this resolves the objective presence of heap-ness via the common consensus of a given cohort of minds. It’s Kantian like in its appraisals. Yet it still holds to issues of (perceived/understood) unitary functionality as delineating individual wholes … and, by extension, individual identities. It’s my current take on the Sorties paradox at any rate. 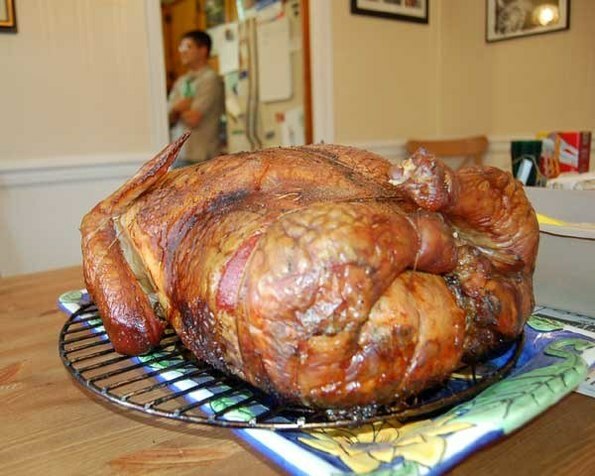 If Turducken exists, then a trout/turkey must. QED. Take some time to consider the circularity here. What is a fundamental physical object? What is a simple without parts? What has been said in the quote sounds profound, but really says no more than "a duck is a duck". What counts as a simple is utterly dependent on what we are saying. The rest of this thread is confusion. So, then, griffins exist too? QED? Do they taste good too or are they less filling? Ya know, as far as exotic foods go. Wouldn’t they likewise exist if we weren’t to say anything? If it doesn't exist already, I can put together a trout/turkey in about 1/2 hour. There's a store down the street that sells both. I don't know any nearby source for lions or eagles. Dude! The local zoos! But then the bribery required for it would likely be astronomical. Hell, and I’m actually a tree-hugger empathizing environmentalist who disdains bribery, including when legalized in the form of government lobbying ... so … never mind. Many things we consider to be objects are made up out of parts. The question is whether something made up out of parts can be singular. I think of myself as a single animal, a person, a mind, etc. But I'm made up of tons of cells. And those cells are made up of molecules, and so on. Are people, rocks, stars actually objects or do we mistakenly think they are? Since this is an ontological question, the concern is with what really is, not how we conceive of people, rocks, stars. What counts as an abject is what we choose to count as an object. That is, your question is about how we should best use the words 'people', 'rocks', 'stars'. The philosophical error here is to mistake a question of grammar for a question of ontology. So basically, we can carve up the world anyway that makes sense, but asking whether our carving exists is to mistake carving for ontology. Almost. Asking whether our particular carving is the one true carving is to forget that there are other ways to make sense of the world, each of which may accept different simples and yet be equally true. Does karma exist? Is it advantageous to belive in karma or pretend that it exists? Might I exist again after I die? Need I be concerned about what will happen to me in this life? Does philosophy cease to exist if a catastrophic event occurs?